I believe I could be quite happy in Lake Wobegon. Some of my favorite aspects of the news updates are hearing Keillor’s cynical opinions on marriage (hey, can you blame me?) as well as his strikingly accurate commentary on religion in society today. Someday I’ll write a Huffington Post article arguing that he is the most accurate voice on how religion has changed in America in the past generation. He makes a lot of knocks on the Unitarians, but then again, who doesn’t? Also, my favorite character is of course, undoubtedly, Pastor Liz–the recently installed pastor of Lake Wobegon Lutheran Church. I could be her–maybe I am her?? And I love the observations Keillor shares about what’s going on in Pastor Liz’s life: Is she dating someone new? Who was the guy she brought to the church Christmas party? What does she do on her day off when she’s not in town? In real life, I might not last too many years as the single, female, solo pastor in a small community, but I could see myself enjoying being the under-the-breath talk of the town for a spell. 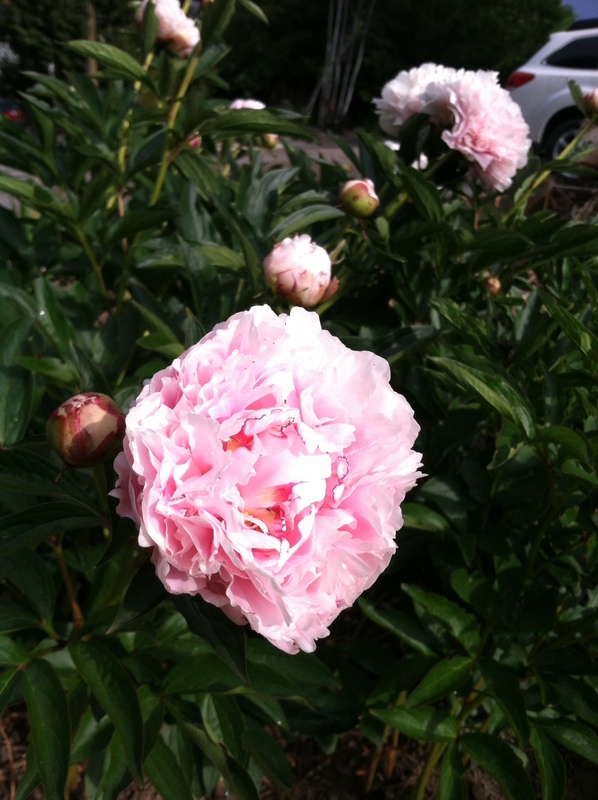 The peonies blossomed while I was away for Memorial Day. They turned out very beautiful and were quite fragrant as well. I expected them to be white, so the pink was a nice surprise. 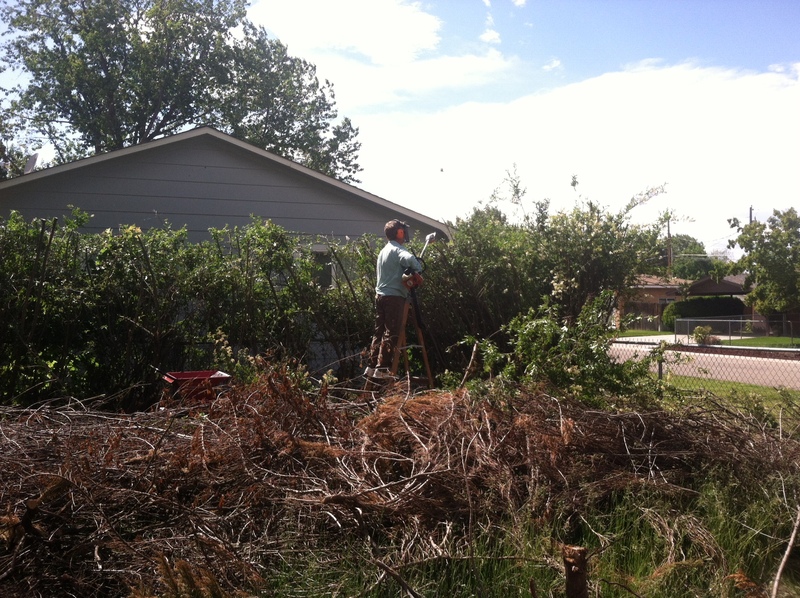 Alex finished trimming “the hedge from hell” and also took down the final two shrubs that needed to bite the dust. Yay, thank you Alex! It’s always good to have a friend who’s handy with a chainsaw. 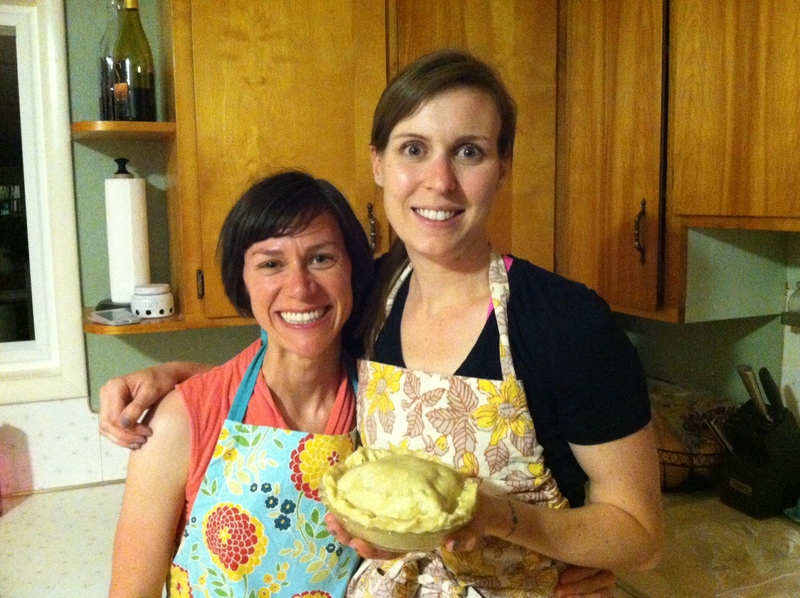 Also, my friend Amanda had me over to teach her how to make pie crust. She created a list of 30 things to do before she turns 30 (in August), and learning how to make pie crust was one of them. She did quite well, and it sounded from her that she learned some new technique tips. I shared a metaphor between making pie crust and bathing a baby (which, again, being as I’ve never had a baby, I’m not sure why this came to mind, but it did, and I think it makes sense). I gather that when one is learning how to give a baby a bath, one tends to be overly sensitive, thinking that the baby is super fragile and needs to be handled with extreme gentleness. Not that it should be roughed around too much or anything–I mean, it is a baby after all–but it’s my limited experience that babies are actually pretty tough, and can handle a lot before getting too upset. (And if you doubt his, just be in the hospital when a new baby is born, and watch the L&D nurse throw that baby around as she washes its hair and wraps it into its first burrito swaddle.) So that’s also my philosophy about pie crust. I follow the time-tested wisdom of not over-mixing it originally, keeping it as chilled as possible, giving it time to rest in the fridge, etc. But when it comes to rolling it out, I think it turns out worse if the roller views it as sort of wimpy and needing to be handled with the aforementioned extreme gentleness. I think it rolls out a lot better when rolled with confidence, and flipped over and patted with flour a few times. It should be solid enough to be twirled around and slid on the counter without sticking, and you should be able to fold it over on itself once, and then again, in order to transport it easily to the pie pan. So, we made a few strawberry-rhubarb pies and chatted it up, and it was fun. Now I give Amanda my blessing to turn 30 and confidently bake herself a pie to celebrate. Saturday I finally had my yard sale to get rid of the crap that’s been taking up the majority of my tiny garage since I first moved here in the middle of winter. The turnout was pretty disappointing and I didn’t make much money, but I was joined by my delightful friend Christie, which was great. (Sorry–forgot to capture it with a picture!) The weather was cloudier than expected, but at least it didn’t get up to 90 degrees, as the forecast had predicted. And fortunately I had the discipline not to absorb any of my goods back into my house, but rather I took a carload of stuff to donate to a nearby thrift store. So now I can move on with cleaning, painting the walls, and sealing the cement floor. Hopefully I will find a fabulous sort of “industrial-chic” light fixture to add some glamour to my garage. Because every girl needs a glamorous garage–just sayin.’ That’ll probably be this week’s job, so I’ll keep you posted on the progress. 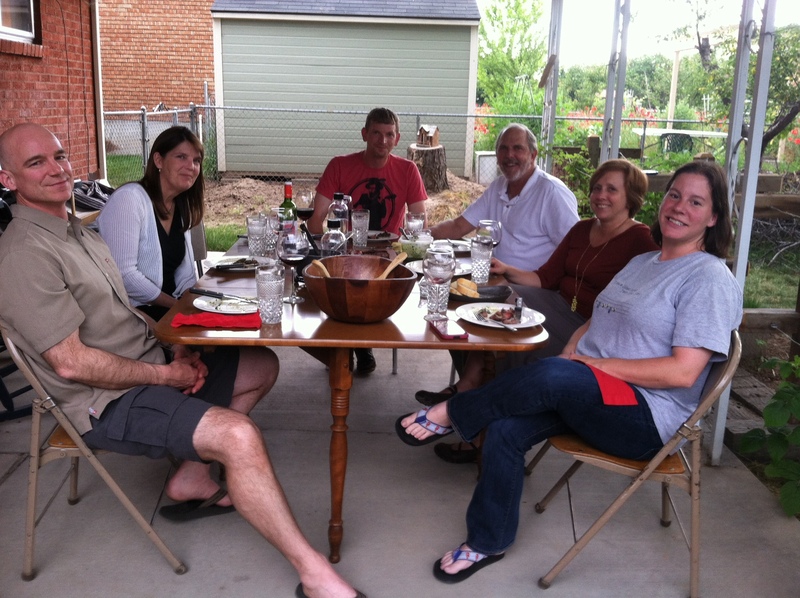 Saturday night I had my dinner party group from church over for a lovely evening meal on the patio. I haven’t yet invested in any patio furniture, but two of the guys were nice enough to haul out my ancient and weighty dining room table. They had to take the scenic route through the garage door and around the side of the house, and then through the back gate, as the table was about a centimeter too wide to get through the back door. So then I was doubly glad I had my yard sale and had providentially cleared a path for them to waddle through. I absolutely love dining outside. It reminded me of how Italy or France feels in the summertime–warm air and warm breezes, delicious food, chilled wine, and lots of laughter. 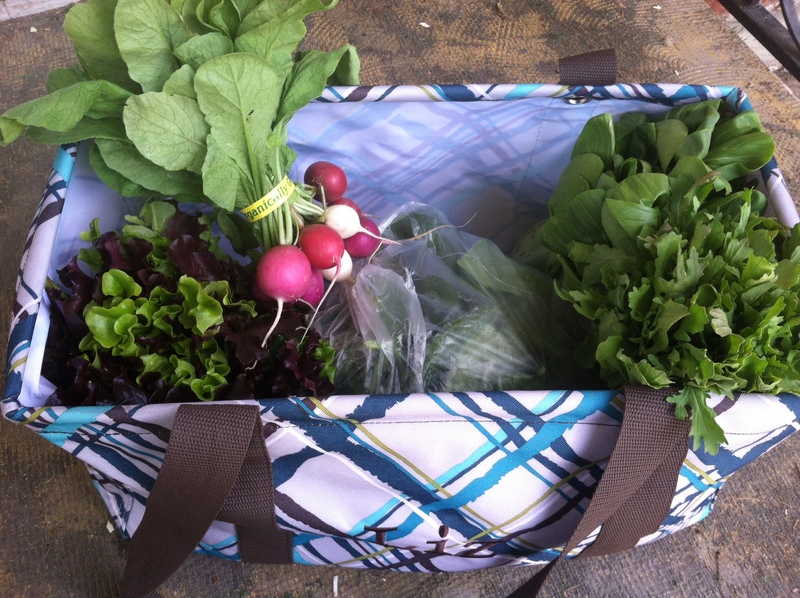 In my CSA box this week I got lots of fresh greens, so I used them and the radishes to make the salad. The last time our group met was just before Thanksgiving, when I was still in the negotiating phase of buying the house and was having a moment of doubt that it might not go through. It’s strange how long ago that feels, but it was really only about 6 months ago. So much in my life has changed since then, but all for the better. So with today, I enjoyed the sabbath, sitting on the patio once again, finishing a few books as well as finishing off the bottle of white we opened last night. I fear the heat has officially come to Boise–alas, we reached 90 today I think–so I should probably learn both how to turn on my sprinklers as well as my air-conditioning. I supposed I should be grateful that I made it to June without needing either, but I’m sad thinking that the heat of summer is already upon us. It is rather oppressive to a girl who grew up in an area that is consistently in the 40-60 degree range, and where “even when it’s sunny, it’s raining,” as my former husband used to say. I’m preaching next Sunday, so we’ll see how much progress I can make on the garage project while reading Calvin and exegeting my passage (which I have yet to select…) in my spare time. Well that’s the news from Satis House, where the woman is strong, there’s hope of a good-looking man, and all the nieces and nephews are above average.